More than half the world’s population virtually lives on rice. Basmati rice is an unique varieties of rice originating from South Asia. Basmati rice is being world popular type of rice at the present time. Many of us are not aware about the difference between the Basmati rice and normal rice. Ofcourse there are several health benefits so it is called healthy grains. There are at least dozen different types of rice if you go to groceries like long grain, short grain, white, brown, instant, converted, Basmati etc. 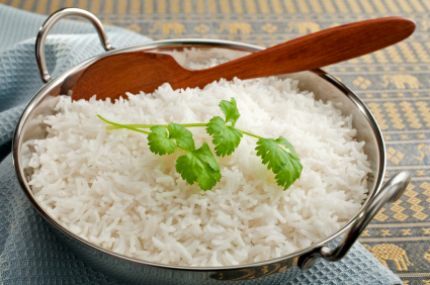 According to Ayurveda, Basmati rice is the king of all rices. Whenever there come rice it is always basmati rice only. Basmati rice is saatvic diet, balances the physiology, nourishing your body tissues and easy enough for digestion. It is light, soft, smooth, cooling and nourishing food. This rice is good for all of tridoshas specially for balancing Vata and Pitta. Basmati rice builds body tissue and is very high on prana or vital life energy. There are various Ayurvedic recipes from basmati rice like Rice pudding, fried rice, khichadi, Rice soup, sweet rice, vegetable rice etc. if you are confused and think “Rice is Rice”, we have several reasons that make Basmati rice special from other varieties of rice. Basmati rice is gluten free and low in fat, sodium including eight essential amino acids, folic acid, and cholesterol free. Energy from basmati rice is released slower, steady rate to balance level of energy due to medium glycaemic index. Basmati rice is unique, distinct, taste than normal rice. Basmati rice has wonderful aroma and fragrance which increase your appetite due to the presence of a chemical called 2-acetyl-1-pyrroline. It is excellent complex-carbohydrate food rich in Vit B and it is non-allergenic too. Basmati rice meets the criteria of healthy food low fat, low calorie, high nutritious diet. As Basmati rice is balancing all doshas it is also detoxifying diet.